Capsule Summary: Furious that peace talks have broken down, Hawkeye takes matters into his own hands and takes a trip to Panmunjom. Meanwhile, Margaret decides to divorce Donald after he requests a permanent transfer to San Francisco. Neither of the storylines in this episode are particular strong. Hawkeye’s A story is just too unbelievable to be taken seriously while Margaret’s B story feels rushed and undeveloped. I think Margaret’s decision to get a divorce should have been either an A story or a more substantial B story. We can all understand Hawkeye’s frustration upon learning that the Army has altered its point system for rotating personnel home and he won’t be heading back to Crabapple Cove anytime soon. Equally understandable is his anger at the lack of progress in the peace talks. But that doesn’t make it easy to accept how Hawkeye can just stroll into the peace talks and start ranting. 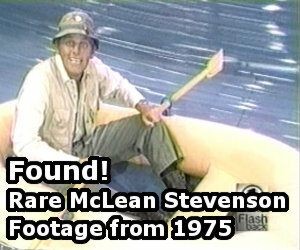 M*A*S*H often–but not always–went to great lengths to remain realistic. In this case, I just can’t willingly suspend my disbelief to accept Hawkeye even finding the peace talks, let alone getting into them. I don’t like the way she runs to Colonel Potter for reassurance that she’s doing the right thing by deciding to divorce Donald. She seems childish in this scene rather than confused and conflicted. By the end of the episode she’s confident again, almost cheerful. It all happens too fast. Maybe that’s realistic for someone realizing their marriage is over but not wanting to fully accept it and then–finally–accepting it. However, it seems a little out of character for Charles to not only participate in the party but also get so drunk that he actually compliments Hawkeye. Hawkeye is about to get dunked. It’s hard to tell but at least a few of the extras in the background during the party in the Mess Tent don’t seem to have red hair. I’m pretty sure regular extras Roy Goldman and Gwen Farrell are in the scene. Maybe Dennis Troy. 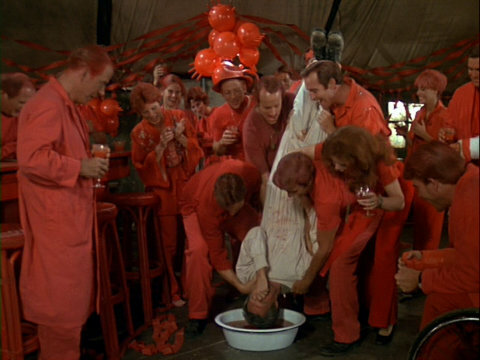 In TV’s M*A*S*H: The Ultimate Guide Book by Ed Solomonson and Mark O’Neill, Kevin Hagen reveals that some or all of his scene at the red dye party was reshot because his “natural red hair did not look natural” compared to all of the dyed hair. Apparently Postal paint was finally added to his hair to make it look more natural. Where is Klinger in this episode? He’s in the very first scene, smoking a cigar and worrying about the sun ruining his hair. Then he disappears until the final scene, answering roll call. He’s not at the red dye party. Also, watch closely and it looks like Jamie Farr wasn’t filmed answering roll call with everyone else. When the crowd disperses, Klinger is nowhere to be seen. This seems to be the ultimate Season 7 episode. I recall seeing a rare DVD combo set of Season 7 and 8 (similar to the Season 1-5 gift set I have) that its box art featuring shots from this episode. That said, the thing about Klinger only being in this episode at the beginning and during the tag, but nowhere else was also jarring and odd. Notice how Klinger seems just as wiped out as everybody else the next day, even though he wasn’t at the party. Have you ever noticed that despite her marriage to Donald, Margaret was rarely, if ever, refered to as Mrs. Penobscott, or Major Penobscott, and she still was called Major Houlihan? I hate this episode, it’s easily in my bottom 10. “Self-righteous” is the perfect description for it. Hawkeye rushing into the peace talks, and suffering no actual repercussions for it? I know this is TV and suspension of belief is a prerequisite, but this is just TOO ridiculous. You know when people talk about how preachy M*A*S*H became? They’re referring to eps like this. Episodes like this, “Commander Pierce,” “The Party,” and the ultimate bad episode (in MY opinion) “Inga,” are why I feel season 7 was the start of “spotty M*A*S*H.” The series as a whole was still good, but the seasons were more bumpy quality-wise than the overall-solid previous years. I have no desire to revisit this one anytime soon. While I agree with you about “Inga,” and Season 7 as a whole, I disagree about “Commander Pierce,” “Peace on Us,” and “The Party.” I liked those, but then again, to each their own, of course. I do agree, it’s not a particularly inspiring episode. I have two gripes about this episode that need to be addressed. 1. Is it true that buttermilk aids in helping relieve gastritis? 2. When Hawkeye and BJ rail against the peace talks, Charles chastises them for being naive. My gripe is why did he preface this by clucking his tongue. Hawkeye: We who are about to dye salute you. I’m honestly surprised this episode is getting quite a bit of negativity – I never really thought it was that bad at all; but again, as I said, to each their own. I couldn’t agree more. I can believe Hawkeye, in his sanctimonious fury, would walk out of the OR (I presume no more wounded were expected), and grudgingly admit he may have eluded the MPs (who I presume were alerted by Potter …did he? I haven’t watched this episode in ages) and made his way to town; but it is absolutely unbelievable he made it into the building where the talks were being held, much less into the conference room. Even in the early fifties security would have been tighter than that, especially in a war zone. I find any episode revolving around “sanctimonious Hawkeye” virtually unwatchable. Does anyone know how the point system works in the show? I assume it was based off of something that really existed, but I can’t find anything solid to match up with the numbers given in the show. Potter says they upped it from 36 to 45. We also know that both Henry and Trapper were sent home for reaching their points. Obviously the time line in the show doesn’t make any sense, but I’m still curious what constitutes a point? I thought at first maybe it was 3 points per month, but that’s clearly not enough. 2 points per month seems to make the most sense, but it’s still doesn’t line up right. With 2 points per month, it was 18 months before being rotated home, and now at 45, it’s 22.5 months. What doesn’t make sense though is that BJ and Potter have been there for a good long while now. At least 6-9 months but probably more. If Trapper and Henry both got their points, 6-9 months or more before Hawkeye, it doesn’t make sense unless Hawkeye got there way after Trapper/Henry. From the sound of various things said in the first 3 seasons, I do think Henry got there before Trapper and Hawkeye, but Trap/Hawk seemed to get there at roughly the same time. Plus in the pilot it’s 1950, and they’re all there. The war was only during 1950 for 6 months. Anyways, I think the answer is probably that the writers just threw out some numbers without thinking about it, but would be nice to know what the system was supposed to be. Officers weren’t sent home based on the point system. I think they got rid of it after WW2. During the Korean War, a point rotation system similar to one established during WWII was used to decide who would be rotated back home and discharged. A total of 36 points was required for a soldier to earn rotation back to CONUS (Continental United States); 4 points were given for each month in a combat zone, 3 points for being located between regimental headquarters and emplaced batteries, and 2 points for rear echelon duty. Margaret was a very independent person, but she was still a woman of the 1950s so it might not have been too unusual for her to blame herself for her failed marriage, or to feel insecure at the prospect of being single and divorced at the time. I also noticed that nobody ever called her “Mrs. Penobscott,” surely she would have been listed as such in her official record. But given how brief her marriage was, maybe nobody had any time to really adjust, including her. Hawkeye bluffing his way right into the peace talks and trying to get them to actually talk to each other was funny, as was Radar and Potter’s reaction (“Thirty years in the Army, I thought I’d seen it all,” he says in disbelief) as was getting one of the North Koreans to actually say “Howdy.” His plea to get them to end the war was actually poignant IMO, although I also wonder how he managed to get to the talks and past the MPs. I remember reading somewhere that BJ’s mustache was Alan Alda’s idea, maybe to distinguish BJ from Hawkeye, and Mike Farrell never liked having it. Farrell appeared in an NBC tv movie called “Battered” fall 1978, and he was still clean-shaven for it, so it must’ve been produced before MASH went into production during the summer. I remember seeing him clean-shaven again on tv sometime early in 1984, so he got rid of the mustache as soon as he could after MASH ended production. By the way, I wonder how Peg Hunnicut would’ve reacted to her husband’s mustache when he got home, since he didn’t have it when he left for Korea. That sounds a bit farfetched. To distinguish Hawkeye from BJ? I actually remember reading that Farrell came back from hiatus with the mustache and they wrote it into the storyline. I wish I knew which was true. Maybe we can email Mike Farrell and ask him. With the mustache came a slight attitude change for BJ too so maybe he liked having it. If you look at the opening roll call scene – the wide shot of the cast lining up – take a look at Klinger. It’s not Jamie Farr, but someone else dressed up like Klinger! BJ’s mustache to me signifies two things. First, it’s emblematic of a slow decline in the show from Season 7 onwards. Sure, it had to evolve and change but as we all know seasons 8-11 got more dramatic. I don’t mind that; it’s just the balance of characters was gone: no Radar, no Flagg, not much Sidney. Margaret (screechiness aside) and Winchester going ‘towards the middle’ and being more or less one big gang. That’s a generalisation, sure, but applies most of the time. Second, the ‘tache signals a change in BJ. He is more bitter, wants to see his family and is resentful of the war; rather than being Hawkeye’s tame sidekick. Notice how young clean-shaven BJ looks in “Fade In…” when accompanying Hawk and (captain/corporal, is it) Radr in the Officer’s Mess. A few seasons later, with ‘tache and longer/greying in places hair, he looks ten years older. Indicative of how the war has affected him.